For many years, the Jagdhornbläser Usedom are very successful guests at many different competitions, both in solo formations and as bigger ensembles. With their work, they create a link from concertante hunting music to hunting traditions, mostly in Mecklenburg area.As the programme of the CD is „cross-country“, it was clear that this recording should be a collaboration with fellow minds from all over Germany. 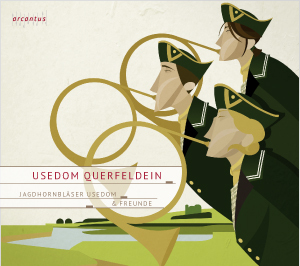 With the support of Oliver Kersken, solo hornist with the Neue Düsseldorfer Hofmusik, they give with the actual CD an overview of their manifold repertoire.